They weigh about 3,000 pounds and eat about 100 pounds of plants each day. 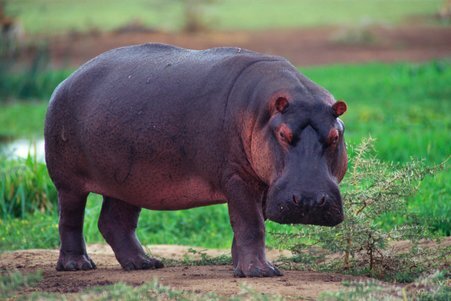 So your average adult hippo produces quite a lot of poop. By some estimates, a single hippo blasts out more than 10 pounds of waste each day. And all that hippo dung gets mixed into the ponds and streams where they spend most of their time. We generally think of this process as beneficial, an ecosystem service, a way for nutrients to flow from terrestrial, streamside ecosystems into the water itself. Their dung is a sort of fertilizer for aquatic life. And all of that is true—at least when water moves from pond to pond. At one time, many African waterways continued to flow even during the dry season. But people have diverted lots of that water for agriculture. So now, Tanzania's Great Ruaha River stops flowing during the dry season, leaving behind a serious of stagnant pools—in which the hippos keep on pooping. "Especially in these high density pools at the peak the dry season, there's a huge buildup of dung. So we ended up pulling up these nets that have no fish but are just filled with hippo dung." University of California, Santa Barbara, ecologist Keenan Stears. Unable to wash downriver, the nutrients build up while dissolved oxygen in the water decreases. "Changes in the chemistry can influence biodiversity within these pools as well. Specifically, fish as well as aquatic invertebrates." There is some hope, though. When the wet season returns and the rivers start to flow again, things can return to normal—if we're careful. "But what our results do show is its not all doom and gloom. This resetting of the system when flow resumes shows that there is some kind of resilience within the system. And if we are able to manage the off-take of water from these rivers, the system is able to actually recover in terms of repopulating these pools in terms of biodiversity and abundance."